On November 19, 2013, Google unveiled its Glass Development Kit, showcasing a translation tool Word Lens, a cooking program AllTheCooks, and an exercise program Strava among others as successful examples. Google announced three news programs in May 2014 – TripIt, FourSquare and OpenTable – in order to entice travelers. On June 25, 2014, Google announced that notifications from Android Wear would be sent to Glass. 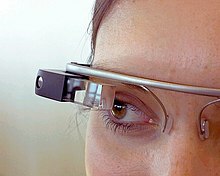 The European University Press published the first book to be read with Google Glass on October 8, 2014, as introduced at the Frankfurt Book Fair. The book can be read as a normal paper book or – enriched with multimedia elements – with Google Glass, Kindle, on Smartphone and Pads on the platforms iOS and Android. In 2014, Voice of America Television Correspondent Carolyn Presutti and VOA Electronics Engineer Jose Vega began a web project called VOA & Google Glass, which explored the technology's potential uses in journalism. This series of news stories examined the technology's live reporting applications, including conducting interviews and covering stories from the reporter's point of view. On March 29, 2014, American a cappella group Pentatonix partnered with Voice of America when lead singer Scott Hoying wore Glass in the band's performance at DAR Constitution Hall in Washington, D.C., during the band's worldwide tour – the first use of Glass by a lead singer in a professional concert.